When Wesley Palms opened on the western slopes of Mt. Soledad in April 1962, it was heralded as one of San Diego’s new wave of retirement communities. Now more than 50 years later, Wesley Palms’ original $5 million Pacific Beach campus is getting a $68 million makeover, every bit as big and ambitious. The 150 two-, three- and four-unit cottages are being rebuilt and 18 added. The heating, air conditioning, fire safety and other infrastructure in the main building’s 121 apartments will be upgraded and remodeled as they become vacant. The 35-acre grounds will be relandscaped with water-wise plants, including just 2.6 acres of grass, down from the present 8.7 acres. New amenities, such as a bistro, computer room, dog park, lounges, fitness center and improved pool area are completed or in the works. A previous campus upgrade included conversion of 22 cottage units into Summer House “memory care” homes and redesign of the main dining hall. The work is expected to be completed in 2020, resulting in 311 apartments and patio-home units, an 18-unit increase. She was the first resident to move out of a cottage she has occupied for the past 18 years and into the main building, where she plans to stay. “At my age, they picked the right place for me,” she said. Originally developed by the Methodist Church’s Pacific Homes, Wesley Palms joined the Front Porch Retirement Communities in 1999; the nonprofit comprises 10 retirement, 26 low-income and two military base-reuse communities. The other Front Porch communities in San Diego are Carlsbad by the Sea in Carlsbad, Casa de Manana in La Jolla and Fredericka Manor in Chula Vista. The original cottages, as small as 435 square feet, had tiny bathrooms, kitchens and limited closet and storage space. “Today’s retiree expects a little more and (Front Porch) wanted to make the units more compliant with the Americans With Disabilities Act, said project architect Michael Paluso of M.W. Steele Group. An earlier redevelopment plan called for the entire property, except the main building, to be demolished and rebuilt all at once. Coastal height rules preclude exceeding the 30-foot limit. But officials decided to phase construction over the next five years so that the residents could remain in place and relocate elsewhere on the grounds as needed. On a tour of the grounds, Executive Director Ben Geske drove a golf cart on tree lined lanes, past the rose garden and shuffleboard court, up a steep hill to cottages with spectacular views of Mission Bay. “I’ve had people move to be near their family,” Geske said. Others were retired military. And of course, many came for the weather. Originally from Wisconsin, Geske moved in 2007, just as master planning began. Taking advantage of the city’s original conditional use permit issued in the 1950s, Front Porch applied for a substantial conformance permit that allowed for reconstruction but no major change to the layout and density. Coincidentally, architect Paluso, 36, is a fan of mid-century modern architecture, a style many of the present Wesley Palms generation welcomed when they bought their first homes following World War II. And so some of that esthetic — indoor/outdoor living, clean lines, efficient floor plans and lots of glass to let in natural light — is being retained in the new, larger patio homes. Jose Hernandez measures out wire for the electrical plan in one of the new patio homes. The large windows look over new patios that will be provided at all units. Photo by Giana Leone/UT. The newest patio homes have been framed and already exhibit some of that 50-year-old home-design approach. The ceilings are taller, the kitchens, bathrooms and bedrooms larger and there are both front and back patios. All new utility lines are being installed. Universal design concepts dictate the layout and arrangement of fixtures, such as accessible showers for people in wheelchairs and microwaves in low-height drawers. Low-energy-using lighting, appliances and fixtures will be used throughout. And Internet-savvy seniors will have access to free WiFi and built-in Internet and cable TV connections. Wesley Palms, by virtue of its name, has lots of palm trees and other specimens that added up to an “urban forest” of more than 500 trees, some planted by residents haphazardly over the years. Landscape architect David Reed said 109 are being removed and 250 replaced, including slow-growing palms, jacarandas, Tipuana trees native to South America and gold medallions. Most of the lawns at Wesley Palms will be removed and new low-water-using grass will be planted instead. Photo by Roger Showley. Most of the lawns will be removed and where turf remains, a low-water-using buffalo grass and Molate native fescue will be used instead. Shrubs and other plants will include lantana and succulents. The rose garden will remain. Beyond the patio homes is the six-story main building where 121 apartments are being upgraded. Photo by Giana Leone/UT. 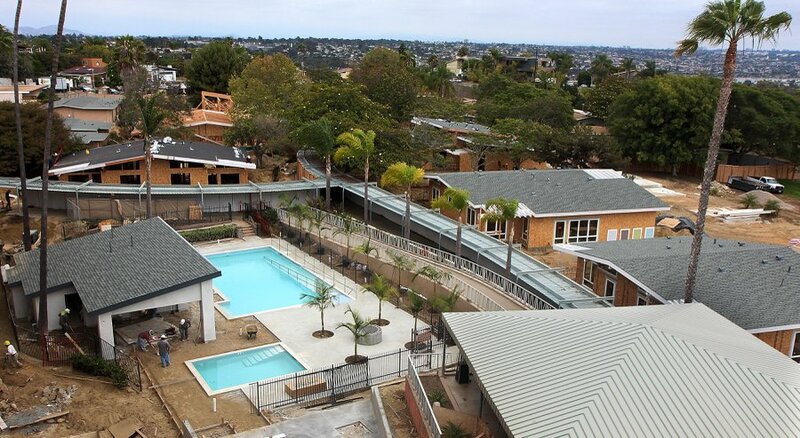 Project: Replace 150 cottage units with 168 patio-home units; upgrade main building’s 121 apartments’ infrastructure and remodel as they become vacant; improve amenities, including the pool area and a new bistro; relandscape with less grass and more drought-tolerant plants. The patio-home units will range from 753 to 1,317 square feet. Rents: Currently $2,600-$3,500 for apartments and cottage homes; new patio homes in first phase, opening in June, $5,510-$7,450. Other charges apply to the memory-care units and assisted-living services.